I’ve said this before and I’m sure I will say it again: anyone taking up the study of a foreign language seriously needs to have a thorough understanding of its grammar. I love using ‘La Grammaire en Clair’ workbook with its accompanying cartoons and generous helpings of humour running through the exercises, and it is fine for GCSE and probably AS Level French. But it doesn’t cover absolutely everything. Schaum’s French Grammar, on the other hand, leaves no stone unturned. A glance at the back-cover blurb reveals that this book contains more than 4,000 test items as well as exercises to help with communication activities. It is divided into chapters that make information easy to find. When introducing a particular aspect of grammar, an explanation is given, followed by examples that use bold for the words that this grammar point focuses on, and a translation of each example into English in italics. As we all know, there have to be exceptions to rules, and these are clearly pointed out. Practice exercises then follow. Each exercise begins with a model that is, in most cases, easy to follow. The exercises involve gap filling, changing to plurals or questions, changing from one tense to another, and so on according to the topic under study. There are, however, some exercises that allow for freer answers, for example ‘Je connais …’ (I know …), ‘Je hais …’ (I hate …) or ‘Je reconnais …’ (I recognize). These would encourage personalized responses on various topics. Nouns and Articles gender and plural of nouns, compound nouns; when and how to use articles, when not to use them. Adjectives and Adverbs – gender and plural of adjectives, comparative and superlative, formation of adverbs. Prepositions, for example avant, chez, de, dans, en, etc., used with places, modes of transportation, and expressions of time amongst others. Numbers, Dates and Time – a section of just ten pages, which nevertheless includes cardinal, ordinal and collective (or approximate) numbers, fractions, arithmetical operations and decimals as well as explanation of how to express the date and the time in French. Verbs – Moods and Tenses is the longest chapter at over 130 pages, thirty-three of which are on the Present Tense alone, with good coverage of irregular verbs. Interrogative Words and Constructions – everything to do with questions and how to form them with both simple and compound verb tenses. Pronouns deals with all types from direct and indirect object pronouns to reflexive, possessive and relative pronouns. Special Meanings of Certain Verbs is an extremely useful section looking mainly at aller, avoir, etre, faire and about thirty other verbs used in particular ways that could not be arrived at by word-for-word translations from English. Answers to exercises follow the chapters, and there are then verb charts and finally a grammatical index. The verb charts contain a considerable amount of information considering that they span just nine pages. (Anyone requiring full conjugations would need a reference book such as Bescherelle.) The grammatical index is organized in an extremely useful way: if you look up ‘avoir’, for example, you will see where to find agreement of the past participle of verbs conjugated with avoir; avoir as an auxiliary verb; expressions with avoir; and the present tense of avoir. 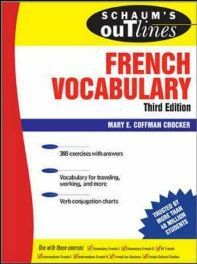 I would definitely recommend this as a reference book that also gives plenty of practice exercises in French grammar. A GCSE student would certainly find everything they needed but much more besides, so there might be a problem knowing how many of the rules need to be learned at that level and what can be passed over. Anyone studying French beyond GCSE level, or anyone preparing to live and/or work in France and wishing to communicate fully with French native speakers could not go wrong with Schaum’s Outline. There is the odd instance of an exception to a rule being cited without a full explanation. In the section on the comparison of adjectives and adverbs, for example, we are told that ‘plus and moins used as adverbs of quantity require de before a numeral’. After several examples we then encounter ‘but’, followed by the sentence ‘Il peut porter plus que deux kilos’. (He can carry more than two kilos.) There is, however, no clarification as to whether this is the only exception where que is used instead of de, or whether there are others. Such shortcomings are few and far between, and on the whole this book gives a very thorough examination of its subject together with plenty of practice. I would not be surprised if, besides learning the ins and outs of grammar, most students would also pick up some vocabulary here that does not usually crop up in the popular communicative coursebooks. I do not hesitate in awarding five stars to Schaum’s French Grammar. Other titles are available for German, Italian, Russian and Spanish, Grammar and Vocabulary (and also French Vocabulary). No Comments on "Schaum’s Outline of French Grammar"